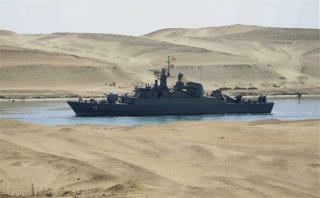 (Newser) – Iran says it has launched warships with orders to approach US maritime borders in the Atlantic ocean, according to the semi-official Fars news agency. "This move has a message," an Iranian admiral was quoted as saying. That message: stand up against the US and its allies for stationing vessels in the Persian Gulf. A US defense official told Reuters that he doubted the claim, but said that "ships are free to operate in international waters." What's the saying---"what is good for the goose is good for the gander". Besides as I read it, we should not trust the Iranan government with nukes--but we thrust OUR govenment with nukes. OK, just wanted to make sure I had my facts straight. Iranians certainly have a fairly strong military, certainly a lot stronger than Saddam Hussein's was, and Iranians being mostly Indo-Europeans are not Arabs and will definitely stand and fight, so they cannot offhandedly be dismissed.They certainly have lots and lots of rockets. Also about 21 submarines. Best we not let them get an atomic bomb too.